Tell me Thursday- Who knew? Tell me Thursday is a chance to explain your Wordless Wednesday post. Join in the fun. The local Children’s museum held a New Year celebration. Here the kids waited patiently on the sides then were let loose on bubble wrap. 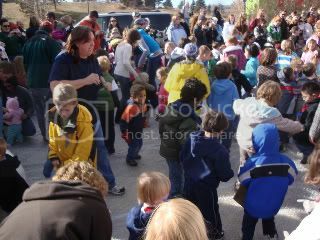 Everyone was jumping and trying to pop that stuff……..very tired but warmer children left that place that day. Who knew that play outdoors at a museum could be so much fun! « Wordless Wednesday- Who knew? I was so wrong! I can now see the bubble wrap. That is such a great idea. Bubble wrap can keep any child occupied! Love it. My Tell Me Thursday answers are here. I still love stomping on bubble wrap! Fun way to exercise and cheaper than a Wii fit! 🙂 Thanks again for participating in TMT this week!